Since moving to Washington, DC, Louisiana native Helanius J. Wilkins has had the good fortune to do what he loves for a living – dance. In addition to founding all-male contemporary dance company Edgeworks Dance Theater, he has taught dance classes at Joy of Motion, the American Dance Institute and The Washington Ballet. “Dance chose me,” he said. “I feel like it’s a calling and I was able to recognize that at an early age.” Helanius shared a memory from his childhood of him watching Alvin Ailey on PBS. Upon seeing Ailey dance, he thought “that’s me” and his journey started from that point on. Since founding Edgeworks Dance Theater nearly a decade ago, Helanius has developed a unique style of contemporary dance. It is a style that is athletic, about real people and one that often reconnects the past and the present. There is dance for entertainment, dance for movement’s sake and then there is dance that communicates. Helanius believes his style speaks to people and goes beyond the physical. It challenges viewers to think and reflect about the issues being presented. According to Helanius, two things lie at the base of his creative process – community engagement and diverse perspectives. He conducts dance workshops, open rehearsals and discussion groups to give viewers an opportunity to be part of the process. These sessions also provide Helanius the chance to hear different viewpoints on the themes he explores in his work. Helanius not only challenges stereotypes through his movement, but also through the members of his company. Edgeworks Dance Theater is a predominantly African-American all-male dance company in an industry dominated by females. One of his company members, Mervin Primeaux, is a deaf dancer which Helanius notes is uncommon among mainstream dance companies. Up next for Edgeworks Dance Theater is a debut in Louisiana. The company will tour to his hometown, Lafayette, for a performance residency Wednesday, October 27th through Sunday, October 31st. They will also have a free performance at the Kennedy Center’s Millennium Stage on Thursday, November 18th at 6pm. The company continues to work on their upcoming production Trigger, which will premiere February 2011 at Dance Place. 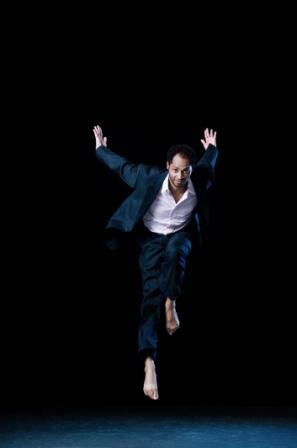 Trigger is part of a trilogy of works that explores the legacy of black men in dance and society. For more information about Trigger and Edgeworks Dance Theater, visit www.hjwedgeworks.org.